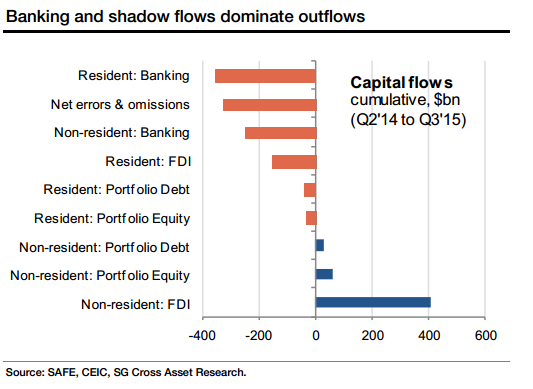 Who’s Behind the Chinese Capital Outflows? The world has somewhat gotten used to the gradual meltdown of China’s foreign exchange reserves, down another $29 billion in February to an even $3.2 trillion, much lower than the $4 trillion peak in 2014. What the market hasn’t figured out is how long this drain will continue and who is actually responsible for the capital outflows behind the foreign exchange drain. Some commentators like Peking University professor Michael Pettis say China has more than plenty liquid reserves available to defend the currency, given its large trade surplus. But he also warns, however, that losing $150 billion of reserves per month for a little bit longer will soon trigger a crisis of confidence. A new report by investment bank Societe Generale sheds light on the origins of the outflows and concludes that a devaluation of the Chinese currency to at least 7.5 yuan per dollar is very likely in 2016. 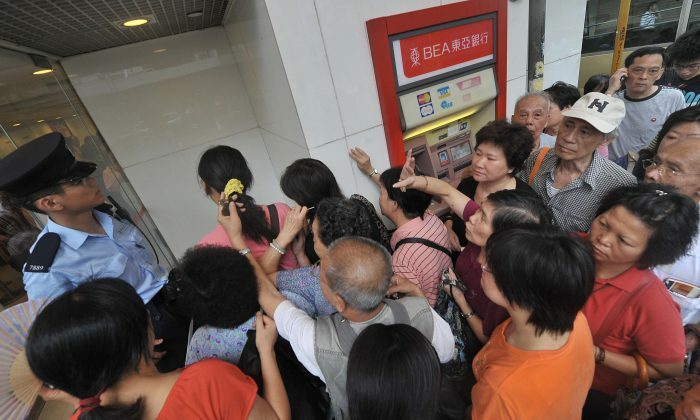 The reason: Most of the outflows come from ordinary Chinese who want to diversify from Chinese bank deposits, real estate, or the stock market. “In the past six quarters (Q2 14–Q3 15), a cumulative $657 billion of net capital has left China, mostly related to domestic resident outflows,” states the report. A large part of the $353 billion coming from the residents is the allowed quota of exchanging up to $50,000 per year. The problem: “If only 5 percent of the population (65 million) choose to do this, the annual outflows would already equal to the entire stock of official reserves,” states the report, citing this type of outflow as the biggest risk to the stable currency regime. This is why even a trade surplus in the region of $500 billion per year will not be enough to offset 1.3 billion potential sellers of the Chinese currency. As a consequence, China is mulling tighter capital controls again, a move that goes completely against the regime’s reform agenda. Societe Generale’s China economist Wei Yao thinks this is coming, “including interbank, [outbound investment] and underground banking. Tightening capital controls on local residents, particularly the $50,000 conversion quota, will provide more bang for the buck,” she writes. So what would trigger a devaluation to 7.5 yuan per dollar in 2016? “If the pace of reserve selling remains fast for two to three quarters, the People’s Bank of China (PBOC) would come under mounting pressure to consider faster adjustments of the exchange rate.” Adjustment downward, of course.